After Todd Barbery, director of a humanitarian organization working with refugees, is assaulted and kidnapped on the streets of Kabul, Afghanistan nothing remains the same. How could it? What Changes Everything is the story of Todd’s wife, Clarissa, who tries to save her husband, while her own life spins out of control in the dark nights of Brooklyn. There on the night streets, she meets Danil, an angry New York graffiti artist whose life was derailed by a loss in the same incomprehensible war half a world away. Danil’s mother Stela writes letter after letter from her bookstore in Cleveland in hopes of comprehending the loss of one son on an Afghan battlefield and of reconnecting with Danil, who abandoned her in anger when his brother died. This is also the story of Mandy, a mother from Texas, grappling with the fury of a wounded son who barely made it home from that war. And it’s Todd’s story, too, who for only a moment let down his guard in a Kabul marketplace and now confronts the worst of possibilities. But, remarkably, What Changes Everything also tells another story: the true story of Mohammad Najibullah, the last president of Afghanistan during the Communist era, whose fall from power was made final by the arrival of the Taliban. The letters in this novel from Najibullah to his three daughters are imagined, but the author had the privilege of lengthy exchanges with one of them, who shared recollections of her father—and a poem her mother had written about him. 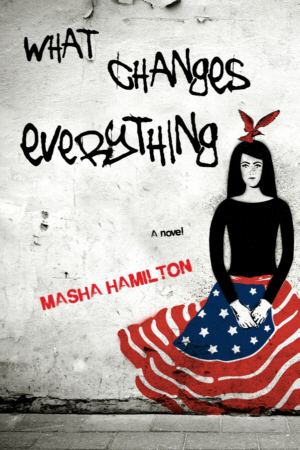 In this knowing new book, Masha Hamilton braids the lives of all these characters, real and imagined, into a powerful novel about the grace of human connections in a world that is so often too harsh and dangerous to face alone.